A man whose son was murdered by the IRA in 1993 has called on Freddie Scappaticci to be investigated for his alleged involvement in the killing. Frank Mulhern’s solicitor Kevin Winters, who is representing a number of victims’ families in civil cases against the alleged Army agent, the Ministry of Defence and the Chief Constable, is urging more people to come forward. Joe Mulhern was just 22 years old when he was abducted by the IRA.He was accused of passing information to Special Branch, interrogated for 10 days, shot and his body dumped near Castlederg, Co Tyrone. No-one has ever been charged or convicted of the murder. Six weeks after he was buried his father Frank – who first spoke to UTV’s Insight programme in 2013 – said Freddie Scappaticci, who at the time was alleged to be a senior member of the IRA’s internal security unit, told him about his son’s murder. Scappaticci was named in 2003 as the highest ranking Army agent working inside the IRA, a claim he consistently denies. Frank Mulhern is convinced the security forces could have saved his son but chose to protect their spy codenamed ‘stakeknife’. “It’s about time Scap was brought to court and that’s all I really want,” he said. Frank Mulhern, together with a number of other families, are now taking a civil action against Freddie Scappaticci, the Ministry of Defence and the Chief Constable. Their solicitor Kevin Winters believes all the abductions and killings allegedly linked to Scappaticci, along with the role of the state in protecting the agent from prosecution, need to be fully investigated. Frank Mulhern continued: “The PSNI have files which could solve a lot of these murders but for one reason or another they’re not acting on them, probably because Freddie Scappaticci is involved. The PSNI said it would not be making any comment. The new British press watchdog set up in the wake of the phone hacking scandal involving newspapers owned by Rupert Murdoch has given the management of The Irish News fourteen days to resolve a complaint from myself that the paper breached its Editor’s Code of Practice in its coverage of the subpoena served against the former Loyalist activist Winston ‘Winky’ Rea. The Independent Press Standards Organisation (IPSO) has written to The Irish News informing the newspaper that if it fails to resolve the matter to my satisfaction the IPSO can then formally consider the complaint. The IPSO can then choose to impose sanctions against The Irish News, if necessary. 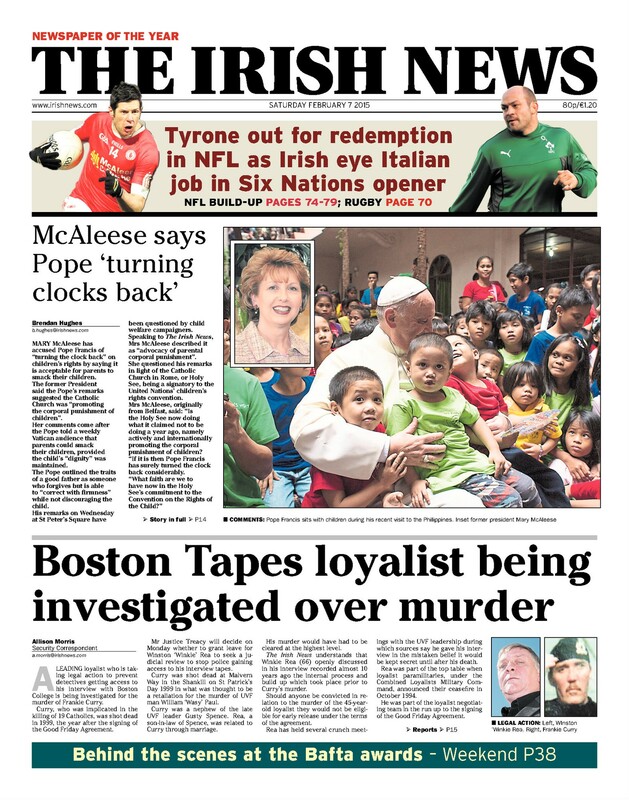 The complaint arose out of a front page story written by Allison Morris claiming that ‘Winky’ Rea had told interviewers from the Boston College oral history project that he had been involved in planning the murder of Loyalist dissident, Frankie Curry and that this was one reason that PSNI detectives were seeking access to the tapes. The Allison Morris story appeared two days before a court hearing in Belfast at which lawyers for Rea were planning to argue that the PSNI had no evidential basis for the subpoena. The Irish News’ story was picked up by at least one Sunday tabloid, The Sunday World thereby enhancing the possibility that the judge involved in the hearing could be influenced in his deliberations. A complaint lodged with the IPSO against The Sunday World was turned down on the grounds that the newspaper is not a member of the regulatory system covered by the watchdog. 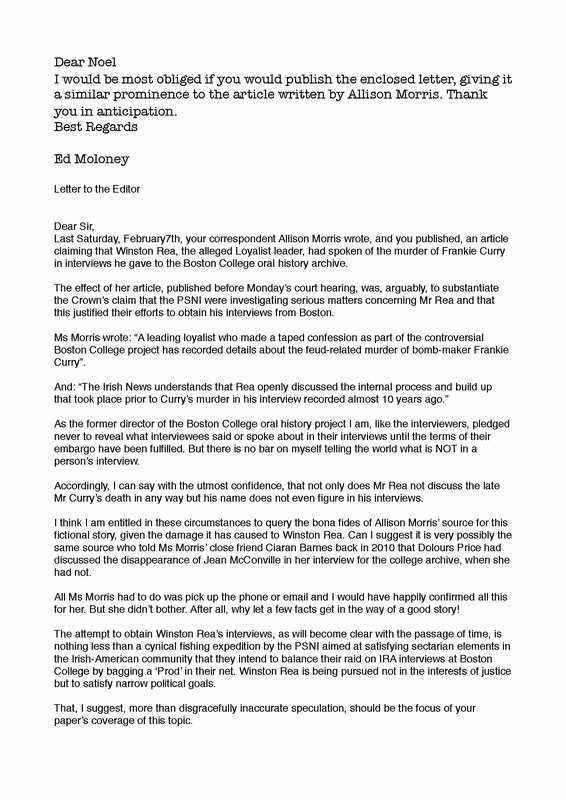 A complaint about Allison Morris’ Irish News’ article was made on two grounds. One was that the story was inaccurate and that if Morris had contacted myself, the former director of the project, she would have been told that there was no basis for her article. 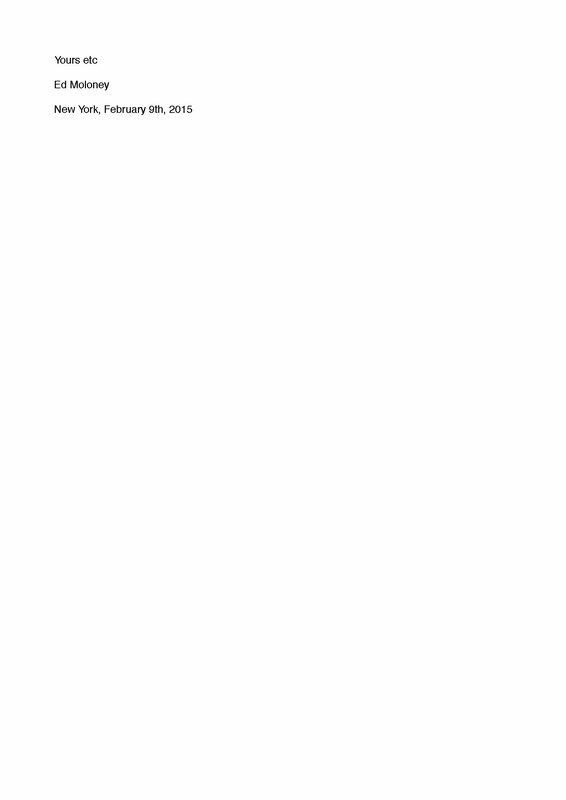 Morris failed to make any contact even though she has my email details. 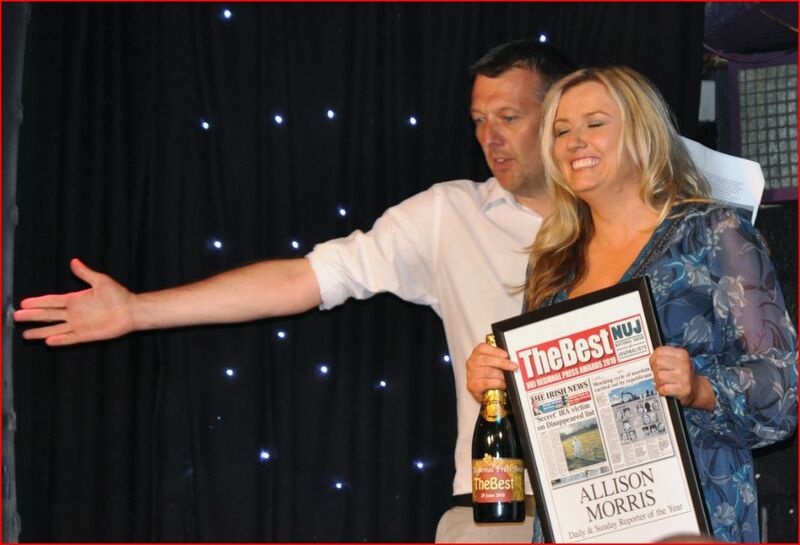 The second ground concerned the failure of The Irish News to publish a letter from myself pointing out Morris’ failings. The offending Irish News article is reproduced below along with my letter of complaint to the paper’s editor, Noel Doran. Greece’s Syriza – A Toothless Tiger? The following article, taken from the World Socialist Web Site, challenges the consensus view of the Greek Syriza party which swept to power in the recent general election in that country on an anti-austerity platform. Far from being the radical, left-wing party portrayed in the media and by many on the left, argues Evel Ekonomakis, Syriza’s actual demands are modest and fall far short of challenging the system that causes Greece’s woes. He questions the party’s choice of allies and predicts that Syriza will backpedal on its pre-election promises (a prescient call given the weekend deal Greece agreed with the Eurozone). The question for Ireland is whether its anti-austerity champion, Sinn Fein would behave any differently if it got into power in Dublin, a not inconceivable proposition in the light of some recent opinion polls. Given that SF’s political ideology is even less defined than its Greek counterpart and could best be described as chameleon-like – it changes according to what best suits the party – would a Sinn Fein-led government behave any differently from Syriza? Ours were minority views. In the week immediately following the victory, most people on the left rejoiced that better days had finally arrived to long-suffering Greece. By contrast, those with right-of-center sympathies sounded the alarm that the new government would tax businesses into oblivion (many even said “they’ll take our houses from us!”) and that the country would unceremoniously be kicked out of the European Union. Similarly outside Greece: socialist voters across Europe are looking to Syriza to provide hope in a continent with more than its fair share of right-wing governments. For right-wingers, however, the pre-election promises made to the Greek people by Tsipras are socialist, even extremist—a view projected by Angela Merkel in Berlin and the Troika in Brussels and New York. There are many things progressive people find endearing about Syriza and its leaders. Like their vows to support the numerous grassroots initiatives that sprung up since 2010, when the Troika put the screws on Greece: soup kitchens, supermarket baskets where people can donate canned food to the indigent, various socialist “Craig’s lists” offering all manner of goods and services free of charge. The laid-back dress code of Syriza ministers has also been praised here, as has their refusal to travel first class, or accept perks the ministers of previous governments enjoyed, including limos, chauffeurs and bodyguards. Syriza came to power on the pledge that it would renounce the country’s 327 billion euro debt, kick out the Troika bailiffs and put an end to austerity that has plagued the country for the last five years. Ever since January 25th, the government has pledged to stop taxing the very poor, prohibit the confiscation of homes by banks, halt the privatisation of two ports in Greece, increase the minimum wage and rehire some public sector workers. A wonderful, fresh new wind is blowing here. Just the other day, upon returning to his office in the parliament building from a lightning trip to Berlin to argue for kinder, gentler treatment, Prime Minister Tsipras found an envelope on his desk with 550 Euros in it—reimbursement for his airline ticket. “What’s this?” he asked his aides. When told, he returned the cash to the government’s coffers and instructed his people to put an end to such practices. But let’s give Syriza a closer look. The first question that’s on the lips of many on the left is why it chose ANEL, or the Party of Independent Greeks, for its junior partner in government. ANEL includes extreme right-wingers, with some members having made explicitly anti-Semitic statements and expressed the wish for immigrants in Greece to “go back to their own countries”. Equally bizarre is Tsipras’ choice of Panagiotis Pavlopoulos for President of the Republic, announced on February 17, a center-right politician who served as Interior Minister between 2004 and 2009. The odd make-up of the government is reflected in the way the ministers dress. While many refuse to wear ties, and some don’t even tuck in their shirts, others don three-piece suits. Yannis Varoufakis has been shuttling back and forth between Athens, Berlin and Brussels, hands cupped asking for money. He’s prompted a great deal of speculation about his untucked shirt and lack of a tie. The Cuban revolutionaries wore combat fatigues, which was fine because they told all their creditors to buzz off. That made sense. This does not. Syriza swept to power on Greek nationalist and anti-German rhetoric. How progressive is that? Not to mention that its demands—though laudable—are actually quite modest. All these self-described “radical leftists” have put on the European table is the request to spend less on interest and more on things like health care and aid to the destitute. Great stuff, but it isn’t socialism. If it is, then Barack Obama is a socialist, too. For the past three years Varoufakis has spoken to diverse audiences ranging from anti-austerity demonstrators in Athens’ Syntagma Square, staff at the Federal Reserve Bank of New York, Green parliamentarians in the European parliament, Bloomberg analysts in London and New York, the House of Commons in London, and hedge funds in Manhattan and London’s City. The one group he has not spoken to are simple working people. This is odd, to say the least, for a self-proclaimed Marxist, even an erratic one. He also adopted Merkelist propaganda in a recent interview addressed to the German public, when he said they “paid so much money to Greeks.” Quite the contrary, no money came to the Greek people; instead it went to usurers and the bankocracy. The average Greek, whose monthly income is well below that of most Europeans, was —and still is—compelled to pay interest rates needed to service loans that save no one but German, French, US, Chinese, and—yes—Greek bankers. Personally, my wife and I, who are fortunate enough to have jobs (we are both teachers) have been driven to the wall by all sorts of new taxes we can’t afford to pay. Our two young children have long ago gotten used to the fact their parents can’t buy them new clothes, or toys, or even go out once in a while to a restaurant together. Many people who are to the left of Syriza—the KKE, or Communist Party of Greece, and Antarsia (this acronym spells “rebellion”), a conglomeration of Trotskyists—are highly critical of Varoufakis’ declarations that he does not want to replace capitalism with socialism. By his own admission, he is embarking upon a campaign for stabilizing the European socio-economic system to avoid the ascendency of right-wing Golden Dawn racist fanatics. He says he is adamantly against the disintegration of the Eurozone. His critics to the left accuse him of practicing a modern-day form of appeasement. They argue that fascism is born of capitalism in crisis and that you can’t save the system from the fascists because fascists aren’t anti-capitalists and pose no threat to capitalism. Not surprisingly, many to the left of Syriza, but also increasing voices from within the party, bemoan the fact that an increasing number of mega-capitalists have recently come forward to say they support Tsipras’ new government—people like shipping and steel magnate George Angelopoulos and petroleum and banking tycoon Spiros Latsis. Varoufakis claims he wants to save capitalism for “strategic purposes”, from itself. Nowhere does he mention what he, Tsipras and Syriza intend to do once they have “saved” capitalism. How sweet this must all sound to big businessmen and bankers in Athens, London, Berlin, Paris, Madrid and New York. Will the new government in Athens move dynamically against Berlin and Brussels? Strange as it sounds, if Syriza has the guts to do so, it will have the support of the ultra-nationalist bigots. This in turn will blunt the Nazis and sharpen the left. If Tsipras’ government does not, the cannibals will return with a vengeance once it falls. Is the real dilemma between capitalism and fascism, as Varoufakis suggests? Or does Greece, indeed the planet, desperately need a more humane, reasonable and responsible way of managing its human and natural resources? Many people here are praying Syriza has opened a door no one can shut; they hope the new government in Athens will infect Europe with a new democratic ethos that will wipe away the unfair trade relations between southern Europe and the stronger powers in Berlin and Paris. But how will this alter the reality that the world is in a deep depression? How will this save us all from the sight of the smoke of our world burning, from another world war, or—which is more likely—a move towards a new, modern form of feudalism? The following article was written by Belfast lawyer, Peter Madden, the long-time partner of the assassinated criminal solicitor, Pat Finucane. Together they founded and ran the well known Belfast legal firm Madden & Finucane. 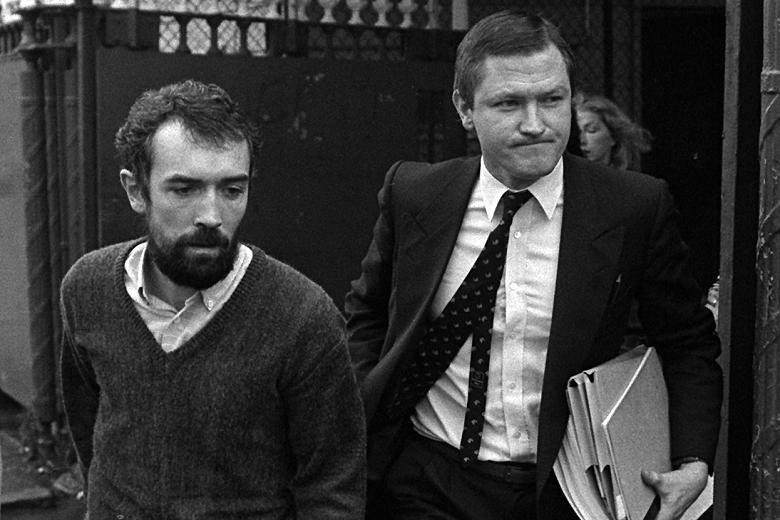 This article was delivered as a speech to mark the 26th anniversary of Pat Finucane’s death and is a forensic examination of the British government-ordered, de Silva review of the circumstances of his death at the hands of a Loyalist assassination squad at his north Belfast home on February 12th, 1989. Let me start by stating that, without doubt, the most important conclusion made by de Silva was that the FRU did not know that the UDA was targeting Pat Finucane. It is my view that this conclusion exonerates the FRU for any part in Pat’s murder. FRU is the Force Research Unit which was the British Army agent handling unit in existence at the time of the murder. If FRU is believed by de Silva to have had no targeting information on Pat Finucane then there was no such information to pass up the chain of command to the very top. Ed Moloney gives a very good analysis of this in his online blog, Broken Elbow. Nelson’s Journal gives an account of how Nelson passed all information from the UDA to his handlers in FRU including the targeting of Pat Finucane. Nelson shifts around a bit on different occasions about whether he passed on information or not but this issue alone should be enough to justify the establishment of a Public Inquiry because there is credible suspicion that Nelson did pass on such information to FRU. There are also allegations that FRU people were helping in the targeting of Pat. The de Silva Review is one man’s analysis of a large amount of material. He has been selective. It is impossible to arrive at the truth unless this material is provided and analysed by others who have an interest in the issues. A public Inquiry with a number of interested parties would allow these interested parties to pursue their own theories and use the relevant material provided to make their own analysis. There are concerns about the authenticity of much of the documentation he refers to in his report. There is no indication in the Report as to how he validated the documents he examined. This is one of the main objections to de Silva’s process. He has gone into minute detail by analysing the documents, particularly the Contact Forms and other intelligence documents without taking a view that some may not be genuine. He has then reached conclusions that may not be true. More importantly he makes the assertion that he used the intelligence documents as a yardstick to test the validity of other material. He says that he had ” the advantage ” of having contemporaneous intelligence records. He doesn’t say how he knew they were “contemporaneous” and it would be difficult to know unless you ask questions. “As with all intelligence material, the above information is necessarily limited in its evidential value, though I have not seen any material to suggest there are any doubts as to the accuracy of this information. Judge Cory, who published his report on 1 April 2004, examined material and he was assured that he was furnished with all information that might bear on the issues he was examining and on that basis he was satisfied that his review was as comprehensive as possible. However, as de Silva has stated in this report, Judge Cory did not get all the material he was assured he would get. He doesn’t say why Cory and Stephens didnt get this material. In chapter 11 page 250 de Silva refers to new information that has just come to light but he doesn’t say what it is. He refers to Contact Forms ( CFs ) and the Security Service’s “compendium of leaks” published in 1989 but he doesn’t make it clear if this is what he means by new information. CFs were examined by Cory. Interestingly, Judge Cory’s document review was similar to de Silva’s in that they both had no power to subpoena witnesses nor to require the production of documents and other material. At least Cory didn’t claim to find the truth about what happened because he was clear that conflicts of evidence, which he found, could only be resolved by examining witnesses in a Public Inquiry. Brian Nelson, the late UDA intelligence chief and Force Research Unit agent. Just exactly when did he become a British military agent? He set out the areas where he could not make any findings and stated that only a Public Inquiry, where documents and witnesses could be examined, could resolve the conflicts and arrive at conclusions. In other words, a review of documents, although useful, was not the end of the matter. Judge Cory’s task was to determine if there was a prima facie case that collusion existed. Judge Cory’s report was a far shorter exercise resulting in 115 pages compared with de Silva of 800 pages. de Silva took a view that the papers that he examined were authentic, which in my view makes it a fundamentally flawed process. In terms of size, the Report is certainly formidable but he has given us is snippet upon snippet of carefully selected material. Unless all the material is examined ( or as much as is legally possible to examine), it is impossible to form a view. He refers to many documents but annexes only a few. He has picked extracts from others. He doesn’t say why. He refers to certain documents and we are not permitted to read these documents in full, let alone challenge the contents. Nor were we entitled to examine any of the original documents. He refers to documents that we did not know existed. Basically, he has read the documents and come to his own conclusions about the content. He has referred to many documents that we have not seen as if he is the only person who can make sense of them and come to the truth about them. Some of these, as he says, he has redacted and annexed but most have just been referred to in footnotes. We don’t know what other material he has examined. Where is the rest of it? In view of the fact that there exist over a million pages of documents, he has to be selective. However, we have not been told how he selected the material. There is no explanation for failing to disclose material. We don’t know how many pages of material exists. Over a million could mean closer to two million. Documents can be verified. Authenticity can be verified. There is a forensic way of doing this. Documents have to be examined in the context and with other documents. You have to know what to look for. If we suspect that a document is forged, we can have the original examined by an expert in that field. If we think that the contents of a document are not credible, we can explore by cross examination, where interested members of the public can see and hear witnesses. ‘Martin Ingram’, real name Ian Hirst, a former FRU soldier maintains that ‘Contact Forms’ which clear the FRU of res[ponsibility in the Finucane murder were fabricated. De Silva refused to meet or question him. This photo shows Ingram/Hirst in his FRU days. There is an allegation by Ian Hurst ( aka Martin Ingram) that the Contact Forms (CFs) were forged. Ian Hurst was a member of FRU and a whistleblower. This has to be a starting point in any scrutiny of the bona fides of the documentation that was examined by this Review. It is incomprehensible that De Silva can come to a conclusion about this without a thorough examination of the documents and a proper examination of Ian Hurst, who he dismissed as a “Walter Mitty” character, and all those others involved. When you take into consideration that the FRU had a year to “sort out” the documents, this whole area needs examined. This was highlighted in John Ware’s Panorama programme. It took a threat to arrest the GOC General Waters to get Nelson’s intelligence material and the CFs weren’t produced to the Stevens team for nearly a year . Hurst said that the FRU had the material during this time and were doctoring it. As highlighted in Panorama, Stevens’ team thought that the documents were tampered with. Hurst is no Walter Mitty character and I met him in Dublin a few years ago introduced by Greg Harkin. Hurst would be a crucial witness in a Public Inquiry but de Silva dismissed him without even seeing him. This goes to the heart of the matter. The fact that the Stevens Investigation eventually got the FRU documentation and there was no reference to the targeting of Pat Finucane and no reference to Pat at all until the morning after the murder when Nelson phoned Margaret Walshaw, his handler. All this is very suspicious. At a Public Inquiry, Ian Hurst would not be the only witness on this issue as there are other FRU members including the commanding officers and those up the very short chain of command who could deal with this particular issue. Many of them made statements to the Stevens team. It is inconceivable that this plot was not known to the FRU. They must have known about it and they must have known that Nelson would be in the thick of it, as chief Intelligence Officer and their only loyalist agent, according to de Silva. Questions would be asked about this at a Public Inquiry. It is just not believable that FRU did not know about the plot. It is believable that they knew about it through Nelson and it is believable that they helped Nelson with targeting Pat as they did with targeting other people and it is believable that they directed the murder and that they doctored the documentation to remove all reference to the targeting of Pat Finucane and to paint a benevolent picture of FRU’s links with Nelson. 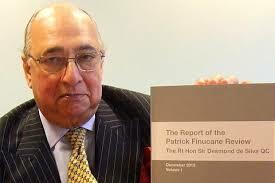 Sir Desmond de Silva, author of the Finucane Review. He is a member of the same exclusive gentlemen’s club, the Carlton, as members of the Tory establishment, including the late Margaret Thatcher and the current Mayor of London, Boris Johnson. The Carlton has an association with the British Conservative Party and its forebears going back to 1832. There is also the important issue of how far up the chain of command did this plot go. The FRU had a chain of command directly to the top of government and there were very few links in the chain: agent – FRU handler – OC Det – OC FRU – CLF & GOC- Defence Minister – and then to the Joint Intelligence Committee chaired by Margaret Thatcher in London. Due to the fact that, according to de Silva, Nelson was the British Army’s only loyalist agent, and that he reported to his handlers on a weekly basis, his weekly FRU reports could easily be dealt with at the weekly Joint Intelligence Committee meetings, in London chaired by Margaret Thatcher. It is inconceivable that Nelson was not a focus at these meetings. Nelson in his diary strongly suggests that Thatcher was a personal recipient of intelligence. There are numerous inconsistencies in the report that cant be left on the shelf. For example de Silva says FRU was founded in 1982 but other authors such as Mark Urban in “Big Boys Rules” quotes CLF Glover who says he established FRU in 1980 to form a ” triumvirate” with the 14th intelligence and SAS. Cory says ” In 1985 Brian Nelson walked in off the street to offer his services to the British Army as an agent”. (page 24 Cory Report) whereas de Silva says, quoting Brian Fitzsimmons, [Nelson] “appears not to have become involved in paramilitary activity until May 1984, when he contacted the Army to offer his services as a source of intelligence (para 6.6 at page 99 de Silva Vol 1 ). Brigadier Arundell David Leaky, on the other hand, a director of Military Operations in the Ministry of Defence who filed an affidavit in injunction proceedings says that “In 1983 Nelson offered his services to the Army as an agent in the UDA”. This document is not referred in de Silva report nor Cory but was published in the “Sunday Tribune” on 14 April 2002 in an article by Ed Moloney. This is an example of the limited nature of the de Silva process. He was limited by virtue of his terms of reference. So what is the truth of the recruitment of Brian Nelson? And what is the truth about the formation of FRU? So was he already in the UDA when he offered his services or was he ” tasked with re-joining the UDA ” after offering his services? These are important issues because the suspicion is that he was a soldier and then a UDA sectarian killer and that these credentials made him a very good candidate for targeting uninvolved Catholics or republicans . Was this the continuation of the classic Kitsonian death squad? In other words a British military unit using local agents as killers whilst funding and supporting them and directing them. There is a suspicion by many that Nelson never left the British army and when he went to Germany in 1985, it was not to get away from the UDA but to train with the British Army in Germany before his re- introduction in a more specialised system and when it is alleged he came back to Belfast from Germany in 1987 is it a coincidence that this coincided with a shipment of modern weaponry from South Africa to arm loyalists in a revived murder campaign against Catholics and republicans. There are many questions to be asked about this. de Silva says that Nelson was not involved in the South African arms shipment in 1987, even though he accepts that Nelson travelled to South Africa in 1985 and discussed arms shipments to the North. There is an interesting issue about Nelson’s trip to South Africa. Judge Cory states that FRU paid Nelson’s expenses for the trip but de Silva doesn’t mention that at all in his report. I wonder why? The absence of this crucial bit of information from de Silva’s report is significant. This is another example of de Silva exonerating FRU and thus the British Government, in the murders Catholics and republicans post 1987. Nelson remained in his targeting role up until his arrest in 1990. This whole issue would be closely examined at a public inquiry where one document could lead to another and all interested parties would be entitled to examine all the documentation, as well as cross-examine relevant witnesses. None of that happened during the de Silva process. There is so much information and misinformation in the public domain about Pat’s murder. There has to be public clarification. It can’t be allowed to be swept under the carpet by Cameron and de Silva. This is just a short narrative of what I think are important areas that have not been properly examined in this review process and which cannot be examined properly until all the documentation is furnished, not just snippets and footnotes. the role of the RUC in Pat’s murder, from the death threats to solicitors from Castlereagh and the other holding centres of which Pat bore the brunt, to the RUC briefing by Jack Hermon to Douglas Hogg with false information about Pat’s family members. de Silva published what he says is intelligence material about this. The detail of the contact between the SB and FRU is crucial and requires a full public examination along with the connection between the RUC and the RUCSB. He published what he calls intelligence which alleges that Pat laundered money for the IRA in the firm where we worked closely together for 10 years. I know this to be completely untrue but I don’t know who concocted it and questions need to be asked about that. He also published allegations that Pat was a finance officer and an intelligence officer in the IRA p 353 Vol 1. He cleverly makes it clear that there is no evidence that Pat was involved with the IRA but I think what is interesting about this is that de Silva published documents in Vol 2 of his report which allege just that. This is a cynical exercise in deception and there can be no excuse for it. He should not have published this material because there was no mechanism in his process for the family members, or me for that matter, to challenge it. the fact that there was an RUC SB file on Pat which seems to have been packed with fact and fiction. Questions need to be asked about how false information got into this file. This whole area needs explored as it will show that this intelligence information was faked beforehand to justify the murder and it had to be beforehand as some of it was briefed to Douglas Hogg in November 1988, when Hogg travelled to Belfast to meet the RUC hierarchy, according to de Silva. the role of the FRU in its entirety and the calling of FRU witnesses to explain themselves and the role of the people in that chain of command. In Chapter 15 there is a what is called Propaganda Initiatives by MI5 in which Pat was targeted and where de Silva implies that the targeting of Pat in this initiative was inadvertent. This needs examined because it is new. I never heard of it before the publication of this report. The various death threats to Pat starting in 1981 which State agents knew about but they decided not to warn Pat about them. Things might have been different if warnings were given. There is the inconsistency in Gordon Kerr’s role, see p 488 Vol 1 that refers to Cory’s analysis of Kerr’s testimony as misleading and also referred to the highly dubious numerical analysis. de Silva challenges Cory at pages 488/489 and goes into a lengthy analysis of the FRU documentation, again accepting their authenticity and says that his analysis takes him in a different direction to that of Cory p 491. In other words Cory got it wrong, according to de Silva. This requires a full examination at a Public Inquiry as there is a clear conflict between Cory and De Silva on this crucial issue of Kerr’s evidence at NELSON’s trial. Cory said that only a Public Inquiry could resolve this issue. The role of government ministers who were cleared by de Silva on the basis that the paperwork showed that ministers were not included in the distribution lists of some intelligence reports. de Silva says at p 500 that Government Ministers were not on the distribution list for a particular report and this is just not believable and it is also convenient. He took the view that because he didn’t see any evidence of ministerial involvement that there wasn’t any. Three” the author states that Margaret Thatcher was chairman of the Joint Intelligence Committee ( JIC ) which met weekly at Downing Street and she ordered a complete review of the security and intelligence set-up in NI ( after the Brighton bomb in 1984 ) and ” from that moment on Margaret Thatcher decided to become far more closely involved in the Irish question. The author states that in her memoir ” The Downing Street Years”, Thatcher said she played a vital role in co-ordinating the services through the powerful and influential Joint Intelligence Committee. The Joint Irish Section (JIS) was strengthened. Interestingly de Silva refers to about half dozen books in his Report including “The Downing Street Years” but not “Ten Thirty Three” which is remarkable since it is based on Nelson and FRU. The British Government took injunction proceedings against the author to stop publication and succeeded in preventing parts of his draft from getting into the final publication. Yet none of this is mentioned in the de Silva Report. Another area to be examined at a Public Inquiry is the reference to a redacted statement of Alan Simpson who was the RUC officer in charge of the murder investigation where Simpson says two army personnel spent an hour in Pat’s house after the murder ( p 137 Vol 2 ) and although he says that he doesn’t think there was anything sinister in that and that it happens all the time, I think questions have to be asked about it. Finally, I would like to comment on perception. Sir Desmond De Silva is a member of the Carlton Club, St James Street London. This club was bombed by the IRA on 25 June 1990. Lord Kaberry, who was injured in the attack, died in March 1991 aged 83. Douglas Hogg is a member of this club as is Margaret Thatcher, John Major and Boris Johnson and other Tory notables. Past members were Winston Churchill and Ted Heath. The club describes itself as the oldest, most elite, and most important of all Conservative clubs.” Membership of the club is by nomination and election only. He is also a member of the Naval and Military Club and Brooks club. So there you have it. Cameron obviously cared little that there might be a perception that de Silva might be biased in some way. It’s unlikely that he would ever be selected to head a Public Inquiry into Pat’s murder due to this perceived bias. I dont know how many times throughout this report de Silva refers to his ” full public account”. It is not a full account. It is definitely not a public account and it is so flawed in its failure to authenticate documentation that it is not anywhere near an account of the truth. David Cameron made a statement in the House of Commons on 12 October 2011 that ” the really important thing .. is to open up and tell the truth” but the truth will have to wait for another day. So, Who Was The Stasi Spy In The IRA – And Which IRA? Avid readers of this blog, and there are some, will doubtless remember that I promised to return to Jerome aan de Wiel’s fascinating new book on the Stasi’s Irish activities, ‘East German Intelligence and Ireland, 1949-90’*, with some more interesting revelations culled from between its covers. Alas, the recent PSNI/PPS and Boston College-led assault on the UVF part of the oral history archive meant I was otherwise occupied for a time and am only now able to return to the subject. For that please accept my apologies. There are a number of stories of special interest in aan de Wiel’s book which I hope to deal with in time but for the following tale I am indebted to Liam O’Rourke who tipped me off to this gem. Some of my older readers will remember that 1988 was a memorable year for many Troubles-related events, political and paramilitary. The Hume-Adams dialogue, a cover for Irish government contact with the Provos, began in January that year, but the IRA also launched its much truncated, post-Eksund offensive against the British with bomb and gun attacks in Britain and mainland Europe. March saw the Gibraltar shootings of three IRA members by the SAS and May witnessed the deaths of three RAF personnel killed by the IRA in the Netherlands. Inbetween there was a bomb attack on a British Army barracks in London. We will probably never know if these were the sparks for the Stasi’s action but 1988 was the year in which the East German intelligence agency decided it was time to recruit an agent in the IRA, alongside a slew of agents in other European, Arab and international terrorist groups. According to aan de Wiel, the decision to branch out in this way was taken some time in the 1980’s by the head of the Stasi, Erich Mielke. The head of the Stasi’s foreign intelligence wing, the legendary Marcus Wolf, later said that Mielke’s decision to recruit agents in foreign terrorist groups was taken so that they could be used as “behind-the-lines guerrilla forces for sabotage against the West”, a decision he didn’t exactly endorse. By the late 1980’s the Stasi had agents, or “inoffiziellen Mitarbeiter” – literally “unofficial employees” or “IMB’s” or plain informers – in the Abu Nidal-led Palestinian Fatah group (6 IMB’s), the ‘Carlos the Jackal’ group (5), the PLO (5), the Japanese Red Army (3) and ETA with two IMB’s. In 1988, the Stasi’s terrorism section, known as HA-XXII, was ordered to recruit agents in the IRA and succeeded in persuading one to work for them. What exactly that agent’s brief was or how successful an informer he or she was – and especially his or her name – remains unknown. But since the GDR ceased to exist by 1990 the presumption has to be that the agent’s value was minimal. Even so, this was an intriguing development which demonstrated, inter alia, just how deeply and widely the IRA had been penetrated, i.e. how open to being seduced its members increasingly were. The long war, it seems, had a downside. aan de Wiel says the Stasi made no distinction between the two IRA’s, Official or Provisional so the agent could have been a member of either. But common sense suggests that if the East Germans wanted someone to cause mischief or “sabotage against the West”, then the Provos would have been the better target. The Stasi and the East German Communist Party presumably had enough lines into the Officials and the Workers Party as it was. So, what happened to the IRA agent when, just a year or so later the Berlin Wall fell and the GDR was no more? The odds are that the name of the IMB was contained in that file. And as Liam O’Rourke commented, it is just as likely that the name was passed on to the British, giving them another agent in the IRA to add to the burgeoning list of informers working for one or other branches of the British intelligence machine. But who knows? 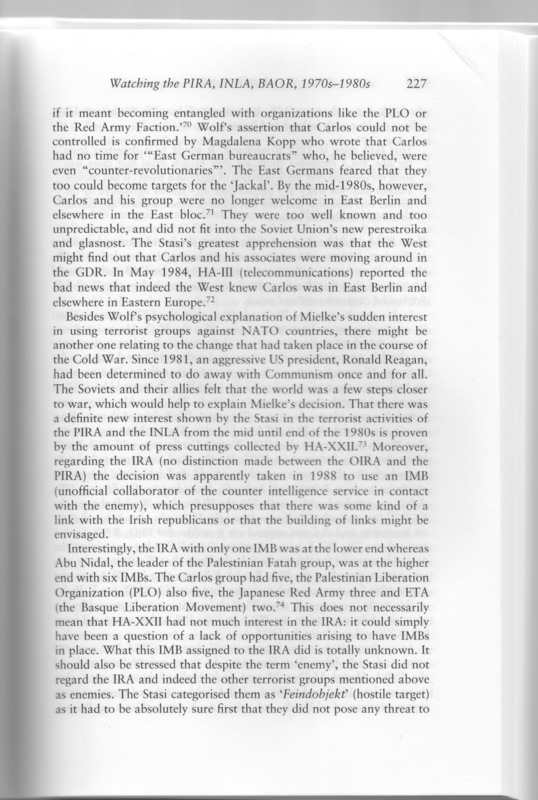 * ‘East German Intelligence and Ireland, 1949-90 – Espionage, terrorism and Diplomacy’, by Jerome aan de Wiel. Published by Manchester University Press. A video released Sunday by the Islamic State appears to show the mass beheading of a group of 21 Coptic Christians, who are made to kneel beside the sea in what is identified as the coast near Tripoli, Libya. It is the first time that the Islamic State, also known as ISIS or ISIL, has released an official video showing such a killing outside of the territory it controls in Syria and Iraq. The footage begins with slow motion images of the Egyptian Christian hostages, who were kidnapped in Libya several weeks ago, walking single file along the sandy beach. The hostages are all wearing orange jumpsuits. Each one is led by a black-clad executioner who is grasping a knife. The only sound is that of the crashing waves. They are made to kneel, and then one by one they are beheaded. • The Conventional Wisdom Is Wrong. Libya’s 2011 uprising was never peaceful, but instead was armed and violent from the start. Muammar al-Qaddafi did not target civilians or resort to indiscriminate force. Although inspired by humanitarian impulse, NATO’s intervention did not aim mainly to protect civilians, but rather to overthrow Qaddafi’s regime, even at the expense of increasing the harm to Libyans. • The Intervention Backfired. NATO’s action magnified the conflict’s duration about sixfold, and its death toll at least sevenfold, while also exacerbating human rights abuses, humanitarian suffering, Islamic radicalism, and weapons proliferation in Libya and its neighbors. If Libya was a “model intervention,” then it was a model of failure. • Three Lessons. First, beware rebel propaganda that seeks intervention by falsely crying genocide. Second, avoid intervening on humanitarian grounds in ways that reward rebels and thus endanger civilians, unless the state is already targeting noncombatants. Third, resist the tendency of humanitarian intervention to morph into regime change, which amplifies the risk to civilians. This policy brief is based on “A Model Humanitarian Intervention? Reassessing NATO’s Libya Campaign,” which appears in the Summer 2013 issue of Interna- tional Security. Many commentators have praised NATO’s 2011 intervention in Libya as a humanitarian success for averting a bloodbath in that country’s second largest city, Benghazi, and helping eliminate the dictatorial regime of Muammar al-Qaddafi. These proponents accordingly claim that the intervention demonstrates how to successfully implement a humanitarian principle known as the responsibility to protect (R2P). Indeed, the top U.S. representatives to the transatlantic alliance declared that “NATO’s operation in Libya has rightly been hailed as a model intervention.” A more rigorous assessment, however, reveals that NATO’s intervention backfired: it increased the duration of Libya’s civil war by about six times and its death toll by at least seven times, while also exacerbating human rights abuses, humanitarian suffering, Islamic radicalism, and weapons proliferation in Libya and its neighbors. If this is a “model intervention,” then it is a model of failure. uprising, whereas Human Rights Watch (HRW) later documented only 233 deaths across all of Libya in that period. Further evidence that Qaddafi avoided targeting civilians comes from the Libyan city that was most consumed by the early fighting, Misurata. HRW reports that of the 949 people wounded there in the rebellion’s initial seven weeks, only 30 were women or children, meaning that Qaddafi’s forces focused narrowly on combatants. During that same period, only 257 people were killed among the city’s population of 400,000—a fraction less than 0.0006—providing additional proof that the government avoided using force indiscriminately. Moreover, Qaddafi did not perpetrate a “bloodbath” in any of the cities that his forces recaptured from rebels prior to NATO inter- vention—including Ajdabiya, Bani Walid, Brega, Ras Lanuf, Zawiya, and much of Misurata—so there was virtually no risk of such an outcome if he had been permitted to recapture the last rebel stronghold of Benghazi. The conventional wisdom is also wrong in asserting that NATO’s main goal in Libya was to protect civilians. Evidence reveals that NATO’s primary aim was to overthrow Qaddafi’s regime, even at the expense of increasing the harm to Libyans. NATO attacked Libyan forces indiscriminately, including some in retreat and others in Qaddafi’s hometown of Sirte, where they posed no threat to civilians. Moreover, NATO continued to aid the rebels even when they repeatedly rejected government cease-fire offers that could have ended the violence and spared civilians. Such military assistance included weapons, training, and covert deployment of hundreds of troops from Qatar, eventually enabling the rebels to capture and summarily execute Qaddafi and seize power in October 2011. The biggest misconception about NATO’s intervention is that it saved lives and benefited Libya and its neighbors. In reality, when NATO intervened in mid- March 2011, Qaddafi already had regained control of most of Libya, while the rebels were retreating rapidly toward Egypt. Thus, the conflict was about to end, barely six weeks after it started, at a toll of about 1,000 dead, including soldiers, rebels, and civilians caught in the crossfire. By intervening, NATO enabled the rebels to resume their attack, which prolonged the war for another seven months and caused at least 7,000 more deaths. The best development in postwar Libya was the democratic election of July 2012, which brought to office a moderate, secular coalition government—a stark change from Qaddafi’s four-decade dictator- ship. Other developments, however, have been less encouraging. The victorious rebels perpetrated scores of reprisal killings and expelled 30,000 mostly black residents of Tawerga on grounds that some had been “mercenaries” for Qaddafi. HRW reported in 2012 that such abuses “appear to be so widespread and systematic that they may amount to crimes against humanity.” Ironically, such racial or ethnic violence had never occurred in Qaddafi’s Libya. Radical Islamist groups, suppressed under Qaddafi, emerged as the fiercest rebels during the war and refused to disarm or submit to government authority afterward. Their persistent threat was highlighted by the September 2012 attack on U.S. facilities in Benghazi that killed Ambassador Christopher Stevens and three of his colleagues. Even more recently, in April 2013, a vehicle bomb destroyed half of the French em- bassy in the capital, Tripoli. In light of such insecurity, it is understandable that most Libyans responding to a postwar poll expressed nostalgia for a strong leader such as Qaddafi. Sophisticated weapons from Qaddafi’s arsenal—including up to 15,000 man-portable, surface-to-air missiles unaccounted for as of 2012—leaked to radical Islamists throughout the region. NATO’s intervention on behalf of Libya’s rebels also encouraged Syria’s formerly peaceful protesters to switch to violence in mid-2011, in hopes of attracting a similar intervention. The resulting escalation in Syria magnified that country’s killing rate by tenfold. NATO’s intervention in Libya offers at least three im- portant lessons for implementing the responsibility to protect. First, potential interveners should beware both misinformation and rebel propaganda. If Western countries had accurately perceived Libya’s initial civil conflict—as Qaddafi using discriminate force against violent tribal, regional, and radical Islamist rebels—NATO would have been much less likely to launch its counterproductive intervention. to help achieve their political objectives, including regime change. The resulting escalation, however, magnifies the threat to noncombatants before any potential intervention can protect them. Thus, the prospect of humanitarian intervention, which is intended to protect civilians, may instead imperil them via a moral hazard dynamic. To mitigate this pathology, it is essential to avoid intervening on humanitarian grounds in ways that reward rebels, unless the state is targeting noncombatants. A final lesson is that intervention initially motivated by the desire to protect civilians is prone to expanding its objective to include regime change, even if doing so magnifies the danger to civilians, contrary to the interveners’ original intent. That is partly because intervening states, when justifying their use of force to domestic and international audiences, demonize the regime of the country they are targeting. This demonization later inhibits the interveners from considering a negotiated settlement that would permit the regime or its leaders to retain some power, which typically would be the quickest way to end the violence and protect noncombatants. Such lessons from NATO’s use of force in Libya suggest the need for considerable caution and a comprehensive exploration of alternatives when contemplating if and how to conduct humanitarian military intervention. Crawford, Timothy W., and Alan J. Kuperman, eds. Gambling on Humanitarian Intervention: Moral Hazard, Rebellion, and Civil War (New York: Routledge, 2006). Kuperman, Alan J. “The Moral Hazard of Humanitarian Intervention: Lessons from the Balkans,” International Studies Quarterly, Vol. 52, No. 1 (March 2008), pp. 49–80. Roberts, Hugh. “Who Said Gaddafi Had to Go?” London Review of Books, Vol. 33, No. 22 (November 2011), pp. 8–18. UN Human Rights Council, nineteenth session, “Report of the International Commission of Inquiry on Libya,” A/HRC/19/68, ad- vance unedited version, March 2, 2012. The Belfer Center is the hub of the Harvard Kennedy School’s research, teaching, and training in international security affairs, environmental and resource issues, and science and technology policy. The Center has a dual mission: (1) to provide leadership in advancing policy-relevant knowledge about the most important challenges of international security and other critical issues where science, technology, environmental policy, and international affairs intersect; and (2) to prepare future generations of leaders for these arenas. Center researchers not only conduct scholarly research, but also develop prescriptions for policy reform. Faculty and fellows analyze global challenges from nuclear proliferation and terrorism to climate change and energy policy. Alan J. Kuperman is Associate Professor of Public Affairs in the Lyndon B. Johnson School of Public Affairs at the University of Texas, Austin. During 2013–14, he will be a Jennings Randolph Senior Fel- low at the U.S. Institute of Peace, in Washington, D.C.
International Security is America’s leading peer- reviewed journal of security affairs. It provides sophisticated analyses of contemporary, theoretical, and historical security issues. International Security is edited at Harvard Kennedy School’s Belfer Center for Science and International Affairs and is published by The MIT Press. For more information about this publication, please contact the International Security editorial assistant at 617-495-1914. When NATO member Turkey carried out savage atrocities against Kurds in south east Turkey not a word of condemnation was raised in the West. Tens of thousands were killed, atrocities were committed routinely. It was on a much greater scale than anything Milosevic could even dream of. Clinton poured in arms, Blair did the same, so did Germany, and the world looked the other way. Now we get lectures on ‘intervention’ and the ‘responsibility to protect’ from the architects of state terrorism. It’s beyond parody. The following is a statement issued by the progressive Unionist Party today. ‘McGrory sabotages efforts to ‘deal with the past’ PUP Leader Cllr Billy Hutchinson slams the DPP for his political witch hunt of Winston Rea. 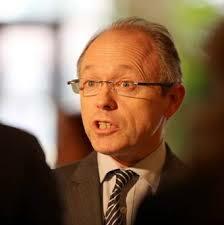 The Progressive Unionist Party utterly condemns attempts by the DPP Barra McGrory to raid the Boston College history archive in a malicious and flagrantly political fishing expedition against Winston Churchill Rea. Mr Rea, who as a representative of the PUP, made a very significant and widely acknowledged contribution to the peace process; from ceasefires to decommissioning and the political architecture which facilitated them in between. 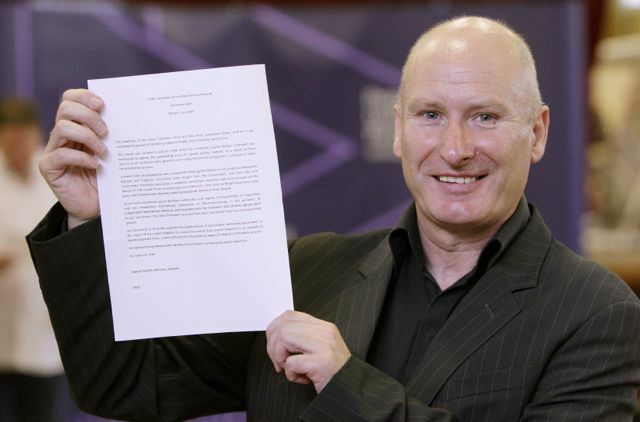 Party Leader Cllr Billy Hutchinson slammed the effort, “This malicious abuse of process before the courts is just another in the long history of ‘balancing’ exercises where Loyalists have been singled out, not on merit but for the optics of appearing independent to a political audience. Internment, collective punishment, shoot to kill, historic investigations, the past is replete with instances where Loyalists have suffered punitive measures for the sake of appearance rather than requirement. He continued, “The distinct lack of evidence in this case is the starkest indication that the judicial process is being used in an exercise of political window dressing. Winston Rea’s rights under the ECHR are being subjected to the unfettered will of the DPP as he continues his overtly political agenda. We need not look to far back to be reminded of a mass supergrass show trial or the ‘On the Runs’ debacle. Perhaps if Winston Rea had been a Republican, he would have received a letter of comfort rather than an international subpoena. Had this material been deposited in a UK University, lack of evidence would have quashed the case long before it reached the eyes of a judge. International legal cooperation has allowed Winston Rea’s Human Rights to be subject to the whims of this DPP by virtue of legal loophole. I would further caution that Barra McGrory’s efforts will lay waste to any hope of ‘dealing with the past.’ The Stormont House Agreement called for an oral history archive and an information recovery process. Both were to be underpinned by strict confidentiality, yet here the DPP seeks to run roughshod over a similar attempt to understand the past and the confidentiality that gave birth to it.